Plum and June: I am speechless! 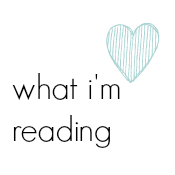 As some of you probably know, I have organized a "little" blog hop the past two years. 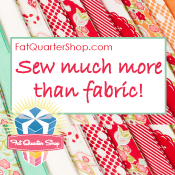 A few months after I started this blog, I timidly emailed some of my new online friends who were also new bloggers to see if they might be interested in a blog hop for new quilt bloggers. If I remember correctly, everyone I contacted responded with an enthusiastic "yes!" What I had originally thought would be a short hop with 10 or so bloggers grew into a 6 month blog hop with almost 100 stops. At some point, I realized that we had to cap the numbers and we had a final blog hop week for the Let's Get Acquainted New Blogger Blog Hop in October of 2012. 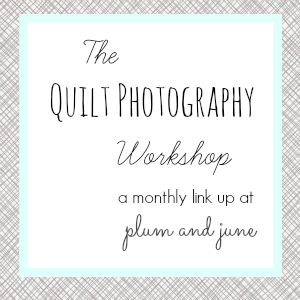 In May of 2013, after much deliberation, I decided to organize another blog hop for new bloggers. Again, the response was overwhelming. For 2013, I decided to make it a bit more manageable for everyone by limiting the hop to the first 75 bloggers to respond and scheduling more bloggers per week so that the hop would only last two months. So, what does all of this have to do with the photos? Well, late last week, I received a package from my friend Em from Sewing by Moonlight. 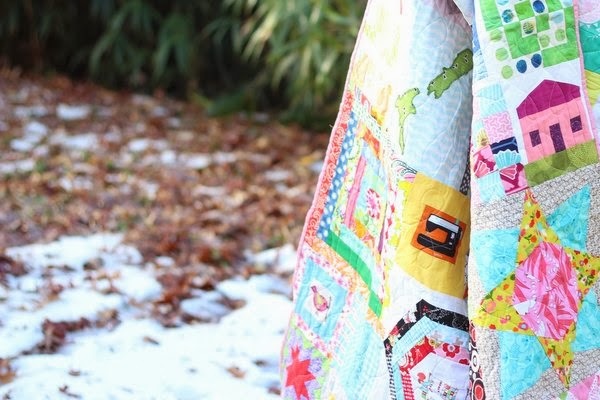 I couldn't imagine what she was sending me - and here is where the speechless part comes in - it was this quilt made by the bloggers from the 2013 Let's Get Acquainted Blog Hop for New Bloggers!!! Wow!!! 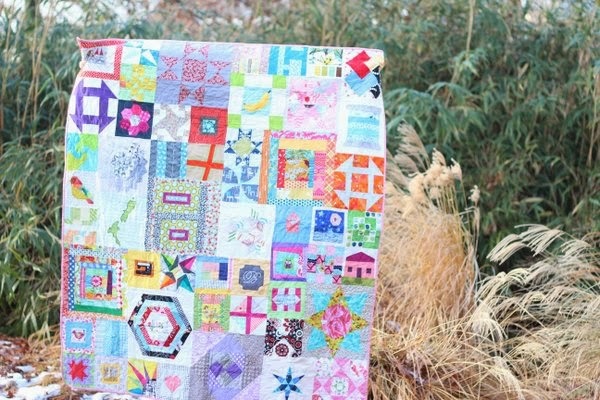 This quilt is filled with blocks from all over the world, I mean, seriously, all over the world! 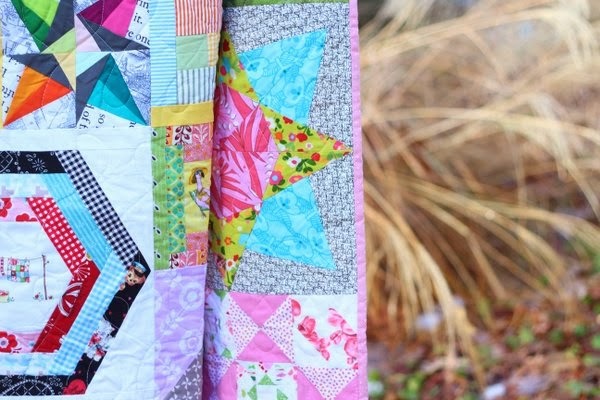 Every single block in this quilt is beautiful and special - while I don't think I can match every block to the blogger who made it, I think I would guess right for several of them! The blocks were pieced together and quilted by Em (who will be posting more about the quilt soon.) Again, wow! For the back, she spelled out "Let's Get Acquainted 2013" in paper pieced blocks and then there are blocks with notes and signatures from everyone who contributed. Okay, one more time - wow!!! I really am speechless. I had absolutely no idea that they (you) were planning this. 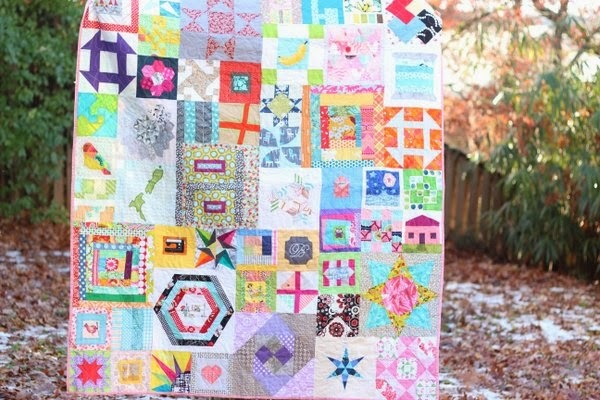 So, to any of you 2013 blog hop people who are reading this post - Thank you for this beautiful quilt. I will treasure it always! What a fantastic and special way to remember the fun we had this year. I am so happy to have "met" each and everyone of you. What a wonderful quilt and a wonderful gift! A big "well done!" to all who participated in the making! What a sweet surprise! As a non-blogging follower, your blog hops are a great way to find new blogs, so thank you for that. Wow! What a wonderful gift and honor, too! I've often thought that what you've done for new bloggers is remarkable! I'm so glad that it made it to you and you love it :) It was a fun surprise to be a part of and can't even come close to express the thanks for the time you put into organizing the hop! Amazing! What a treasure! You so deserve it! It looks awesome. We had a fun tme figuring this all out for YOU! Em knocked it out of the park putting it all together! Thanks sew much for getting us acquainted. From your "Ohio Star" block. YAY!! I'm so glad you have it, and glad you LOVE it! Being a part of the Let's Get Acquainted Hop this summer was such a wonderful experience, and you are so wonderful to organize it for all of us. Excellent!!! So glad you received this piece of loveliness. What a beauty it is all put together - Em did a MOST fantastic job of making this happen. Thank you again Beth, for supporting all of us newbies with your awesome blog hop, it truly was appreciated. I'm glad you like it!! It was such a joy to participate in the hop! It is well deserved for putting us all together, and putting up with our crazy! Thanks for all you did! And thank you to Em for spearheading such a wonderful project! That is so cool. Really. Even though I did not participate it helped me to start my all English blog and I'm so glad I made that move. Thank you! Wonderful! Em did an amazing job putting all those together and keeping up with us! Haha. Glad you like it! 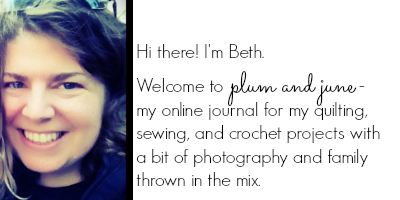 Thank you for your blog hop Beth.. It was definitely a jump start for new bloggers like me. What a great idea and a wonderful quilt to boot, enjoy it Beth you deserve it! Beautiful! Enjoy your lovely quilt and happy memories. What a beautiful surprise. Fantastic! 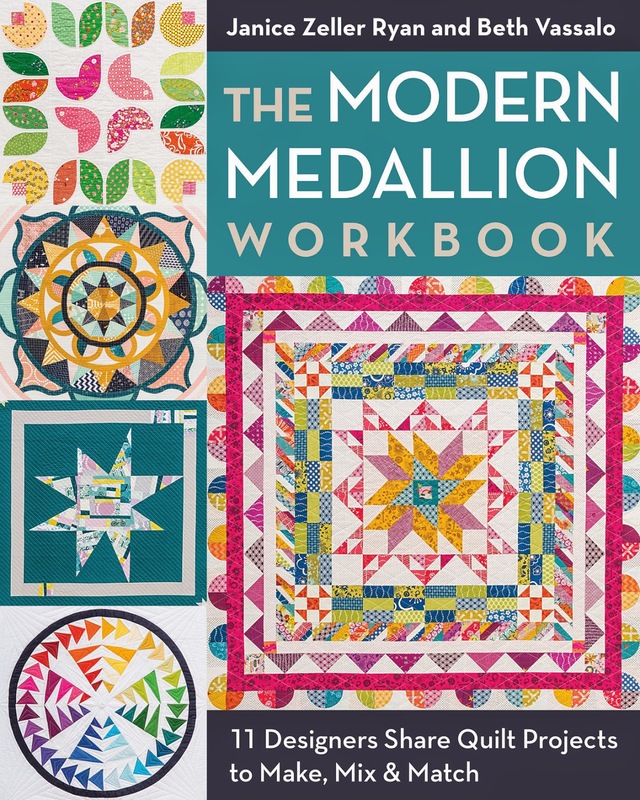 I am so glad that you like it and Em did an excellent job piecing it, quilting it, and finishing it up. It was a fun group to have been a part of so thanks again for organizing such a great event. I met some really awesome people through it, so thanks and "We" are glad you like it!!! Em did such a great job! We had fun making our blocks! The quilt turned out great!! It looks wonderful all put together! You definitely deserve it you did such a great job organizing the blog hop! Thank you for all your hard work. Em did a beautiful job on it! Surprise! Em did a great job putting it all together and quilting it. I made the pink FMF heart on the bottom row for you :). So glad you love it! 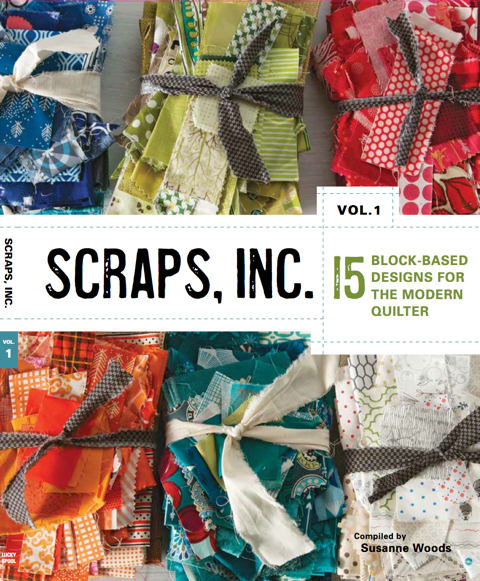 The blog hop was so fun and it was a great project to contribute too! I made the striped block with the blue dears and the gray leaves, kind of in the middle left. Then forgot my sig block so In The Boon Docks block is on the front! Thank you for organizing and encouraging new bloggers! You are the best! It was so much fun and I had a blast - thank you so much for hosting. So exciting to see you with the finished quilt! I was so happy to be able to participate in making it as a giant thank you for organizing the hop. Thank you! Woohoo!!!! The blog hop was the best thing ever...meeting and STILL keeping all the friends met along the way has been awesome! We owe it all to you!! Your the best!! :) (I made the yellow block with the deer in the woods poking out). Hugs!! Thank you for organizing the Blog Hop, an incredible experience. 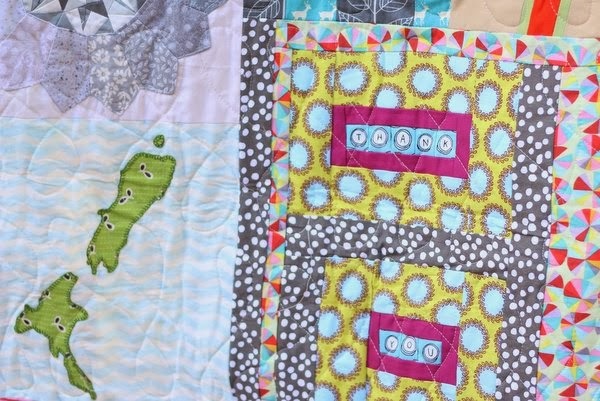 I am so happy you like our quilt (and it really worked out as a surprise!). Thank you to Em too for all the hard work. Yay, so glad you got it! :D Big kudos to Em for coordinating the big effort. And the quilt is of course very well deserved. Thank you for all the work you put into the blog hop!! Mine is the block that looks like the palette builder with the magnolia print and the rectangles of color below it (It's in the top row). So fun! You deserve it, Beth! What a great way for all the new bloggers to say thanks! You gave sew much to us, Beth. Thank you for everything! Wishing you and yours a very Merry Christmas! This is such a wonderful and special gift! They did an amazing job. You totally deserve it. Let's Get Acquainted is such a fantastic event! It turned out so pretty! I had really wanted to contribute a block but I had already packed up my sewing machine to move. You deserve it, the blog hop was so fun! Glad you liked it Beth - it has been really fun being in the bog hop and then in the secret quilt project. Thank you for all your hard work. Mine is the birdie with the needle. Em did a great job on it and am so glad you liked it Beth. We had so much fun with the blog hop. Thank you for hosting the blog hop and making the huge blogosphere a little smaller and more like a family! I had a blast participating and hope our paths cross again soon! Thank you so much! Glad you liked it. Em did fabulous work! How perfect! Gotta love the power of the web. And what a wonderful gift. What a beautiful quilt, Beth! Such a sweet sentiment, and it's so pretty, too! Wow that quilt is beautiful! And what an amazing gift! Wow, it is great! It is so exciting to see it completed. I'm really glad you like it Beth and that it was a surprise! Thank you for all your efforts!. Now sit back and enjoy!! We are so appreciative of you coordinating the wonderful blog hop! Glad you love the quilt! This is incredible!!! What an amazing gift! What a wonderful way to remember friends! Love the colors!